He took my needles away! Ha tolto i miei ferri! For the first time ever, I lost a pair of knitting needles while traveling-- a security guard in Milan's Malpensa airport decided that my 20" long US size 4 Addi circulars looked dangerous, and confiscated them. Apparently wood doesn't show up on their xray machines very well, because he ignored my KnitPicks interchangeable circulars with the lovely wood tips. Per la prima volta ho perso un paio di ferri mentre stavo viaggiando-- un guardiano di sicurezza ha deciso che i miei 50 cm 3.5 mm Addi ferri circulari apparissero pericolosi, e li ha confiscati. Evidentemente il legno non si rivela bene nelle macchine radiografiche, perche' non si e' interessato ai miei circulari KnitPicks con i punti di legno. I would have been more upset-- Addis aren't cheap-- but I had nothing on the needles at the time, so there wasn't the added insult of having to strip any work-in-progress off of them. Plus, the husband and I had just endured the stupidity of the clerk at the check-in counter, who informed us that our carry-on bags, at 12 and 13 kilos, were too heavy, but if we wanted to go to the little store across the hall, we could buy a couple more bags and split the contents, bringing the weight of each bag under the 8 kilo limit (we were allowed two carry-on bags apiece). Did it do any good to point out that the total weight would be the same (even slightly increased, because of the two new bags), but the total volume would be much greater, because half-empty framed suitcases take up the same amount of room as full ones? No, it did not. And by the time we got to the security line, the zipper on my cheap new bag had already broken. Mi sarebbe stata piu arrabbiata-- gli Addi sono cari-- ma allora non ho avuto niente sui ferri, e quindi non ho dovuto rimuovere niente da loro. Anche abbiamo appena soffrito io e mio marito la stupidita' della impiegata al banco check-in, la quale ci ha detto che i nostri bagagli a mano erano troppo pesanti, pero' potremmo comprare due bagagli in piu, e dividere i contenuti, cosi' il peso di ognuno sarebbe sotto il limite di 8 chili. Ed anche se abbiamo fatto notare che il peso totale sarebbe uguale, pero' il volume sarebbe molto di piu, perche' i bagagli rigidi hanno lo stesso volume, vuoti o pieni? Non ha fatto una differenza. E dal momento che abbiamo raggiunto la coda di sicurezza, la cerniera della mia valigia nuova era gia' rotta. 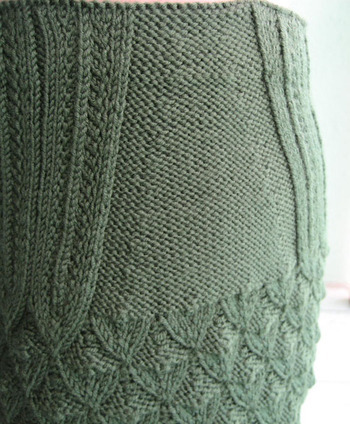 To be quite honest, the Hearts of Oak pattern is not the speediest knit around, especially when worked on US #3 needles. The unblocked fabric is fun to look at in different lights, and its almost crunchy texture invites you to grasp a handful and squeeze-- but even so, it seemed to me that I knitted endlessly on Selva before finally reaching the point where it was time to start the waist decreases. I had swatched the "ribbon" stitch pattern I used for the top of the skirt, and measured the swatch stretched to determine whether a zipper was necessary: I decided no. As I progressed toward the waistband, decreasing steadily in the plain purl sections at the sides, I instead started to worry that the waistband would stretch out of shape: the "ribbons" weren't quite as firm as I had hoped, and of course the reverse stockinette wasn't firm at all. That's why I decided to add the elastic to the waistband. In the case of this pattern, the sizing was dictated by the stitch pattern: the difference between sizes is two repeats or 20 stitches (or 2 1/2 inches) at the hips. Having said that, it is easy to change the frequency and number of waist decreases to customize the fit for a larger or smaller waist in relation to hips. Filatura di Crosa "Zara" is a great choice of yarn for this skirt; it has tight twist, lots of resilience, and seems to be fairly durable (standing up well to frogging). It also comes in an extensive palette of colors. If another yarn is substituted, I would encourage using something with similar characteristics. A quick glance at yarndex suggested these as possibilities (note that I have no personal experience with any of them): Jaeger Matchmaker Merino DK or Extrafine Merino DK; Dale of Norway Falk; Classic Elite Classic 150; Debbie Bliss Rialto DK; Louet Gems Opal; or Knit Picks Merino Style. Note that for most of these (as for Zara), the suggested needle size is larger than US #3, and the gauge thus looser than the 6 sts to the inch I got in stockinette stitch with #3s. SWATCH! I stopped by my LYS today to pick up a set of US size 6 dpns, and the only ones on their wall display were 12 inches long! I mean, is there really anyone who would rather use 12-inch-long dpns than, say, a 24 or 32 inch circular needle? Someone who works as a security guard and can use them as weapons in a pinch, perhaps? Luckily, a helpful saleslady found a set of normal-length Brittany birch dpns tucked into a basket on the floor. I know I had a set of #6s, but they seem to have disappeared, and I need to complete a sample of a special edition of Beaufort I'm creating for sale at a certain LYS (not the one I just visited); the owner requested a version using a thinner yarn. I feel somewhat awkward about offering a pattern for sale that is gratis on the web, but I am rewriting for a different gauge, in a larger range of sizes, and I plan to use a new photograph, and reformat the whole thing to make it more suitable for display in a bricks'n'mortar store (and more portable for the on-the-go knitter). After I got home, I realized that I had a pair of metal 14-inch-long dpns that look to be about a US size 8. I have no memory of ever having used them for anything, and why do I only have two? Did I use the others to stake tomatoes or hang curtains? Hmmm. P.S. Thanks for the well-wishes concerning the sailing accident; the victim is mending, and gives his assurances that that particular mishap will never happen again! I've been so busy, what with trying to finish my project for Big Girl Knits 2 and planning for our family's pending move to Italy*, that I almost forgot: the fall Knitty will contain one of my patterns, for a pullover. Woohoo! Of course, I can't say much more than that, but I offer this photo as a hint. *Travel bulletin: I've been on a dozen flights in the last 3 months, both transatlantic and within Europe, with both metal dpns and circs, and with not a peep from a single security checkpoint.